Two jobs at the Insurance Commissioner's office just posted this week - a Legislative Liaison and a Policy and Rules Manager. Both positions are exempt, open until filled and salary depends on experience. The Legislative Liaison is responsible for developing and managing our legislative and policy strategy, including developing our legislative agenda, legislative testimony, bill analysis, and stakeholder management. They're also the principal policy advisor to the executive management team on legislative and budget proposals impacting the agency. The Policy and Rules Manager supervises staff in our Policy and Legislative Affairs division, prepares position briefs, decision memos, reports, coordinates rule-making for the agency, and drafts and adopts rules on behalf of the agency. If you're interested or know someone who might be, encourage them to apply soon! See most recent earthquakes in our area - are you ready for the big one? We're getting ready for tomorrow's Great ShakeOut Earthquake Drill by cleaning out all the stuff under our desk - how about you? It's been a long time since the Nisqually Quake, but if you lived in Washington state then, you probably remember where you were and what it felt like. Some of us here in Olympia - only miles from the epicenter - heard what sounded like a freight train. Others saw the ground move like water. Are you ready for the next one? 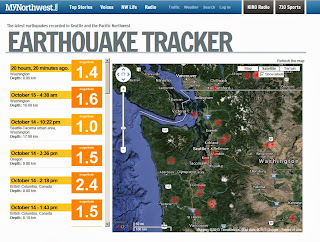 Check out the earthquake tracker on KIRO's mynorthwest.com. It'll show you the most recent quake, how big it was and where it occurred. And don't forget about earthquake insurance - here's what you need to know.